The roots of Mongolian architecture go back to very ancient times. Ancient constructions, early complexes of men's burials, which from even from the Stone, Bronze and Early Iron Ages are met quite often in Mongolia. Stone sculptures, rock paintings, burial sepulchers are very valuable materials for studying the primordial art. For instance, graves with quadrangular barriers, dated from the IV-III centuries B.C, are widely spread over the territory of the central part of Mongolia. 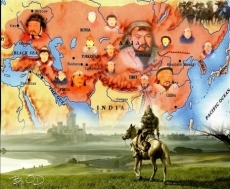 In the first millennium of our era a series of states emerged on the territory of the Central Asia replacing each other. The ruins of settlements, fortresses, palaces and ancient strongholds of the periods can be still found in present day. Until now about 200 such monuments have already been found on the territory of Mongolia. The complex of the King's palace was protected with fortifications, which in their turn were surrounded with water canals and had defensive role. The remains of stupas are the sighs of buildings, which stood on both sides of the canals. The colored frescoes of a Buddhist temple, laying under the palace of Ogoodei , which was found during the exploration of Khara Khorum, an ancient Mongolian capital, can also be considered as one of the monuments of the Uigur architecture. The emergence, the rise and the decline of these cities reflect the common regularity of the development and peculiarities of the nomadic architecture. The interiors of the Ger. The most honorary place in the ger is the northern side, straight opposite to the door, where earlier a home altar was placed. The left side is the woman's part, the right one- men's side. Along the walls chests, caskets, beds and other articles of everyday home life were placed in semi-circle. The men's part is the place for guests: at the centre, under the arch a hearth is situated. Near to it, on the left side of the ger, we can see utensils, buckets, plates and dishes kept, and milk products, skin bag with fermented mare's milk, horse harnesses and other articles of animal uses are on the right side from stove. Round form of the ger gives an opportunity to use the space as much as possible. The door of the Mongolian Ger is always faced towards the south. The sun rays penetrating through the upper window and indicated time based on 12 month's lunar calendar. For example, at the exact mid day the sun light falls on the upper most center of the northern part of the ger. Additional vertical props-2 columns are placed to support the cupola of big gers. Sheds and tambours are made to protect from severe cold, strong wind and double door –to protect from snow storms and rains. Sometimes two gers are attached to each other. All these changes became necessary because of the settled way of life. Nomadic tribes lived in “hurees” or in circle. Whenever the tribe moved to another place it was settled in a circle without fail. In the centre of the circle a hooded cart of an elder was fixed. A camp set up by nomads in this way had military and defensive purpose to repulse surprise attacks of enemy. Images of “Gerlugs” are often seen on rock paintings of Bronze Age. There are over 50 of them, and proceeding from them it can be assumed that “Gerlugs” existed from very early times. Wilhelm Roubrouc, a French traveler, who visited Mongolia in 1253, testifies in a book called “Travel to eastern countries”, that they put their houses on wheels, and woven switches serve as the walls of the house. The walls are joined at the top thus forming neck of the house. They are covered with white felt and the felt is often saturated with lime or bone powder to make it glitter brighter. Sometimes around the neck a black felt decorated with beautiful drawings on different themes is put. At the entrance of the house a felt covered with clothes of many bright colors is hanged up, and vines, trees birds and animals are made of colored felt. Furthermore, W.Roubrouc writes that such dwelling is made in large forms, and the width between the wheels of a carriage is 20 feet or 6 meters. The traveler counted 22 bulls pulling one Ger carriage. An iron bush from wheels of 8 to 21 centimeters in diameter was found recently during the excavations of Khara Khorum ruins and confirms these reports. W.Roubrouc also depicts another variety of carts, sheltered square carts with doors, for the transportation of which camels were harnessed. The sizes and the carrying capacities of these carriages demanded subtle engineer intellect, because a man had to think not only of traveling distance, but also about the easiness, comfort and safety of movement while crossing mountains and rivers. The system of disposition of nomadic tribe's dwellings and stands, the form and construction of yurtas and carriages were passed on from one generation to another. It becomes clear from sources that steppe aristocracy – kings and loyal people besides ordinary gers used also in the 13 century, Ger headquarters of large sizes for thousands of people. All these Gers and marquees represent by itself a simplified model, a construction of nomadic architecture verified by time. And the distinguishing feature of it was the simplicity of assembling and disassembling system. The decorations and ornaments of these Gers also corresponded to the architecture itself: symbolic ornaments, allegorical images of animals were drawn in colors on silk, brocade, felt and skin. Appliques were also made on coverlets, and everybody present there enjoyed looking at them. The custom of the building gers, temples and fences using such ornaments and decorations, was continued till the beginning of the 20 century. The necessity of the significant development in economy, culture, trade, handicraft and metallurgy helped to build settlements, different in scales and in their extend of functional differentiation; stability of the state was followed by the strengthening of cities, by building frontier fortresses , with the increase in the number of settled inhabitants and improvement in agriculture. The construction of Khara Khorum, the capital of Mongolian empire, played an important role in monumental architecture not only of the 13 century but in the whole history of the ancient Mongolian architecture. According to the information left by eye witnesses the city was surrounded by wall with 4 gates, and the distance between them was 3 miles. Various agriculture and animal goods were sold from gates. There were 12 different cult constructions in the city. All these constructions represented a whole city, an administrative capital, a gigantic town together with the Khan's palace, a military metallurgic basis, and garrisons of military forces, agricultural districts, ballast population, Bukhara and Chinese trade lines. One of the greatest sights of them was 5 tiers Buddhist temple, built in 1256 on Munkh Khan's instruction. Its height was 300 chi /1 chi equals to 0.3 meter/ and the width is 22 meter. On the ground floor there were niches were the statues of different deities were kept. Another example is Ogoodei Khan's palace, which was square from made of 2 tier and with 8 by 8, altogether 64 columns, The entrance of the palace faced to the east; 2 tier gently sloping marquee roofs with tiles of green, red colors hung from the central axis. The roofs were decorated with sculptures and figures. The disposition of walls, the arrangement of window opening provide large hall with illumination and ventilation. In the architectural composition of the palace the tradition of nomadic ger's structure and the planning of Kidan's constructions, i.e. the tradition of centric conception of the great steppe is noticeable. According to the Roubrouc's description, a big silver tree, at the foot of which there were 4 silver lions, each of them has a pipe inside …. The ends of those pipes were turned down and each of them was made in the form of a golden snake's head. The tail of the snake swirled around the trunk of the tree. From the mouths of snakes 4 different drinks ran down. One was a wine, the other- a fermented mare's milk or koumiss, the third-honey, and the fourth –rice's beer. At the foot of the tree an angel made by Wilhelm stood. On the territory of country, Mongolian Kings has several both settled and nomadic residences. Ogoodei khan had seasonal residences. Four times in a year the Khan with his retinues moved on determined route. Tsogt Taiji, an enlighther of the 17 century, an ardent fighter for the unity of the country ordered to build a castle surrounded with high walls, and fortifications. The complex of the castle was consisted of 6 temples and other constructions. The lower part of the wall was made up with stones, the upper one- with bricks, among which brick slabs with imprints of a hand, a characteristic of Kidan buildings, can be found. The medieval cities of Mongolia are multifunctional town building formations which evolved under certain historical conditions, and they combined originally in itself the structure of nomadic and settled organization of life. 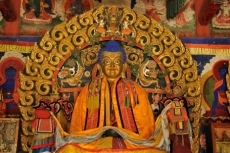 The next stage in the development of the Mongolian architecture is closely connected with the Lamaism, which was widely spread at the end of the 16 century. However, it was in the form of settled buildings. Although 17 century's town and temple buildings displayed mixed styles of the Tibetan and the Chinese, the basis of the Mongolian architecture was the structure of the nomadic ger and marquee. The peculiarity of constructing ger and marquee became the most important sources for further development of the national architecture. In the settled way of life it was not necessary to carry or disassemble gers. Therefore, people began to erect them on special foundation. The construction of the frame of ger style building became more complicated. Various building materials began to be used for it, such as: beams and bricks. The form of it obtains round, square and many sides shapes. The large Ger style buildings, mainly temples were erected on some basis with pedestals. The outside walls consist of wooden framework. Between pedestal and wall there is another row of poles in circumference a bit higher than previous ones. 4 central columns are leaned on the square frame and fortified each other with cross beams located right under the roof itself. Later upper outlet is placed and erection takes shape of truncated one. In early times the Ger consisted of spoke and frames, in summer it was covered with light materials and in winter –with felts. Besides that one more shed tier of marquee form was erected on Ger and cone shaped smooth grounds in roof. The shed was a bit smaller in size than the base, and it brought diversity into the form of religious construction. Religious constructions of the stationary type used heavy building materials and demanded new architectural solutions. The Chinese classical architecture exactly Don-Gun art of having complicated roof with console construction also exerted influence on it. Gers have been a distinctive feature of life in Central Asia for at least three thousand years. The first written description of a Ger used as a dwelling was recorded by Herodotus of Halicarnassus, who lived in Greece between 484 and 424 BC. Herodotus, who is regarded as the father of history, was the first person in the world to record an accurate account of the past. 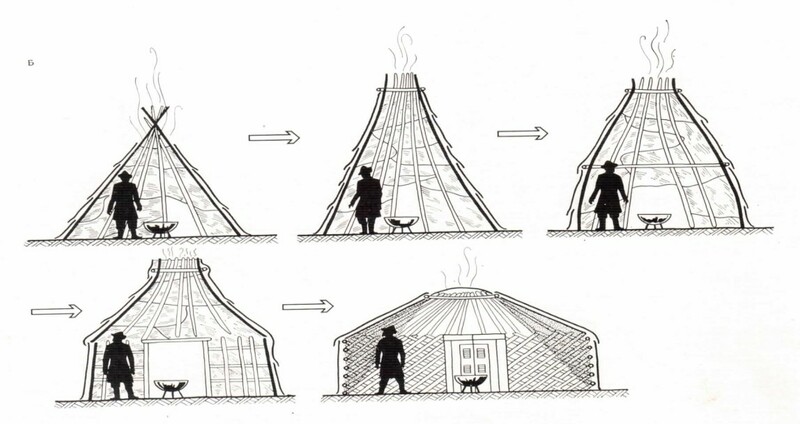 He described Ger-like tents as the dwelling place of the Scythians, a horse riding-nomadic nation who lived in the northern Black Sea and Central Asian region from around 600 BC to AD 300. Thus, the Ger was described in the first historical document in the world. Gers have been continually in use since this time as habitation for the Mongolian nomadic peoples of the Central Asian Plateau. 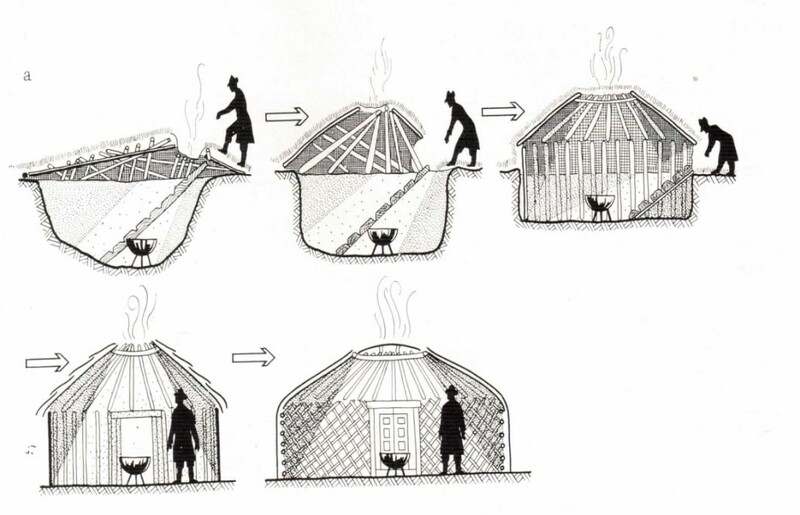 Archeological evidence proves that the first empire of steppe warriors in Central Asia, the Huns, who were active from the 4th to the 6th century AD, used yurts as their principal dwellings. 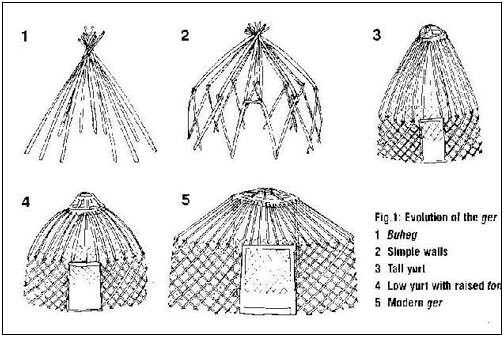 The evolution of the modern Ger almost certainly began in prehistoric times with the urts or buheg; a tipi like structure, still used by the reindeer breeders of Northern Mongolia and Siberia . 1. 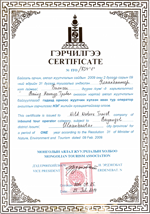 What are the passport and visa requirements for Mongolia? 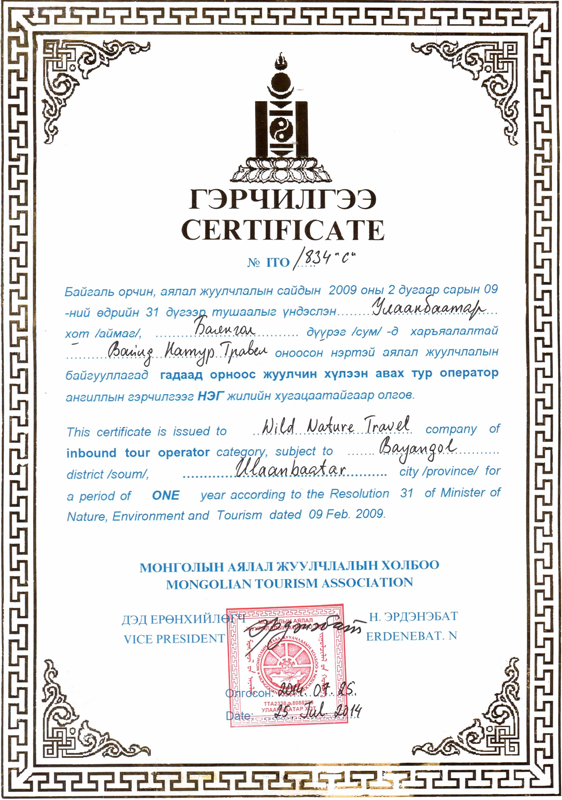 All travelers require a valid passport in order to visit Mongolia. Your passport must remain valid for at least 6 months after the last day of your visit. Please be sure your passport has been signed and has adequate space remaining for entry and exit stamps. U.S citizens do not require a visa to enter Mongolia. However if your transit time in China exceeds 24 hours, it is imperative that you obtain a double- entry Chinese visa in advance. For most other nationalities including Canadian and European, DO require a visa to enter Mongolia. Please contact us for more information or you may also check with U.S Immigration and Naturalization Service (INS) or the closest consulate before departure to see if any special requirements apply to your case. 2. Do I require any vaccinations prior to traveling? Wild Nature Travel is not qualified to provide any medical advice and we highly recommend that you consult your personal physician to determine your particular needs. According to the Center for Disease Control, no immunizations are required for entry in to Mongolia from the United States or for reentry into United States for Mongolia. The Centers for Disease Control and Prevention (CDC) recommends Tetanus/ Diphtheria and polio inoculations be up to date for all international travel and that you consider an immunization against Hepatitis A and rabies. If you are arriving in Mongolia via China, please note that China requires that you have a yellow fever vaccination if you are entering the country from, or have recently been in certain countries in Africa and South America. An International Certificate of Vaccination must be validated b the center that administers the vaccine and carried with you on your trip. Please plan ahead as some inoculations must be given in sequence and the entire immunization process could take as long as eight weeks. 3. What is the best time to visit Mongolia? 4. What kind of clothing and shoes do you recommend for packing? 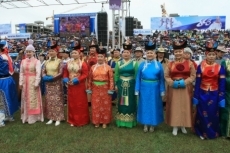 Since temperatures in Mongolia can vary widely during the day, it is best to carry casual clothing that can be layered. Dress is informal and jeans or similar attire is appropriate. For those traveling to the mountain regions, particularly in spring and autumn, warm hats and gloves are recommended as well as a jacket appropriate for cold and windy conditions. 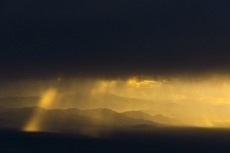 You should bring a waterproof jacket or other rain gear such as a poncho or an umbrella. A broad brimmed hat is useful for sun protection. Proper footwear is essential; be sure to bring comfortable walking shoes or hiking boots. Rubber Beach sandals will prove useful when using the bath and toilets at the ger camps. You may also wish to bring something that can be used as a cover-up while using centralized facilities. 5. Can you accommodate my dietary restrictions? We can accommodate those with special dietary needs, such as vegetarian or low-fat diets. However food choices may not be as plentiful or flavorful as you are used to. Please let us know in advance if you have any special dietary needs. 6. What kind of food is served during the tours? 7. Is bottled water available during the tour? Yes, bottled and boiled water is available in all places you will visit as part of our tour. 8. I suffer from motion sickness. Are these tours suitable for me? Mongolia being a vast country, certain itineraries might necessitate drives on unpaved and bumpy roads. The roads can also be dusty and you may find a scarf or handkerchief helpful. If you think you may be prone to motion sickness, please bring your own medication to alleviate possible discomfort. 9. What should I do in case of a medical emergency? Pack ample supply of basic health and first-aid needs, including any prescription drugs and vitamins. Medical facilities are available in Mongolia, however since standards and methods of treatments are not the same as ours, the prospect of illness or hospitalization should not be taken lightly. If you have a serious medical problem or a medical condition that might be adversely affected by strenuous travel, please contact us so we may provide more precise information. The Wild Nature Travel strongly recommends the purchase of a comprehensive travel and medical insurance including medical evacuation coverage. 10. Are your tours suitable for all age groups? Mongolia has something to offer to everyone. We have trips that cater to families with kids as young as 3 years old and there is no upper age limit for most of our tours. More important than age, our tours are designed for those who share our enthusiasm for discovering out-of –the-ordinary destinations. 11. I cannot ride a horse? Can I still join your tours? For most of our tours, the horse riding adventure is completely optional and if you choose to ride it is suitable for beginners. The treks normally last for an average of about 1-3 hours. However, certain tours such as the Steppe Ride????? on Horseback and Horse trek to Hagiin Har Lake require some prior experience in horse riding. 13. How is the accommodation in a traditional Ger camp? 14. Are there attached bathrooms? Normally not- the most Ger camps offer western style shower and toilet facilities in their central building. 15. Is hot water available throughout the day? Hot water is available only at certain times during the day; your Mongolian guide will let you know when to expect hot water so you can plan when to shower. No, toiletries are not provided at traditional Ger camps. You will need to bring your own soap and washcloth for your stay. Towels provided in each ger are small; you may therefore prefer to bring a larger towel of your own. 17. Are there electrical outlets in Gers? Is electricity available throughout the day? 18. Are there ATM’s available throughout the country? ATM machines are not widely available in remote areas. Your best option would be to withdraw cash in the capital city of Ulaanbaatar prior to commencement of your tour. There are ATM machines available at the main branch of the Trade & Developmen Bank and State Department Store. If you plan on using an ATM facility, please contact your bank prior to arrival to ensure there are no international restrictions. 19. How can I exchange currency? US Dollars are accepted in most places along with Mongolian currency, the togrog. Mongolian currency can be readily obtained from hotels as well as major banks. It is advisable to carry the majority of your money in cash, preferably large and smaller denominations (tens, twenties and fifties). You should also bring a selection of ones and fives ($20 in ones and $50 in fives) for purchasing small souvenirs. Please ensure that all bills are relatively new and in good condition. Old, faded or ripped bills will not be accepted, nor will fifties and hundreds that are not the new issue. 20. Are there restrooms/ bathroom facilities available during our daily excursions? 21. Is there a luggage limit? Domestic airlines in Mongolia have strict luggage limitations of 33-44 lb check in bags and 11 lb for carry on. So, plan to carry on small duffel bag for the excursions in the countryside and a backpack. You can leave your luggage at the hotel. More attractive prices for groups of 12 and more people! If you travel with us 2+ times you can get 10% off. Copyright © 2019 WildNatureTravel.com All rights reserved.